Celebrate Roots & Shoots Peace Day with us! Each September, Roots & Shoots groups from around the world celebrate Roots & Shoots Peace Day and honour the UN International Day of Peace. Dr. Jane has been a UN Messenger of Peace since 2002 and she inspires us all to live in harmony with nature and each other. Each Roots & Shoots project is a step towards a future in which humans can live in peace in an environmentally sustainable way—a step towards achieving the UN Sustainable Development Goals. Celebrate Peace Day with people, animals and the environment through the activities below. Share your photos on the Global Roots & Shoots Facebook Page and using #RootsandShoots #PeaceDay on social media. Build an official Jane Goodall's Roots & Shoots Peace Dove Puppet — Dr. Jane's favorite! Share your peace artwork and it will be featured on Dr. Jane's Facebook Page. Host a Human Library to share diverse perspectives on peace. Host an intercultural picnic and contribute to our "Cook in Peace" cookbook. Celebrate peace through art and theatre. The Day’s theme for 2018 is "Together for Peace: Respect, Safety and Dignity for All." 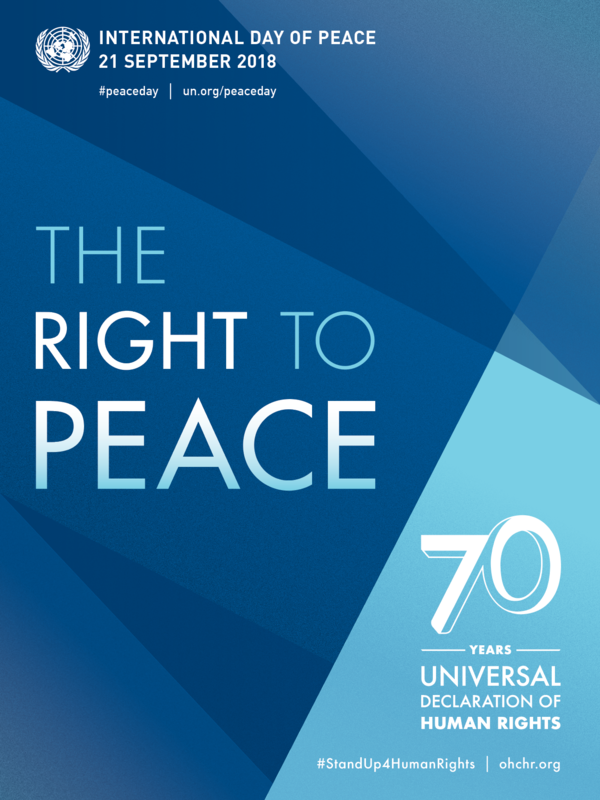 The theme celebrates the 70th anniversary of the Universal Declaration of Human Rights. The Universal Declaration of Human Rights is a milestone document in the history of human rights. Drafted by representatives with different legal and cultural backgrounds from all regions of the world, the Declaration was adopted by the United Nations General Assembly in Paris on 10 December 1948 as a common standard of achievement for all peoples and all nations. The Universal Declaration – the most translated document in the world, available in more than 500 languages – is as relevant today as it was on the day that it was adopted.